Last year, tennis star Rafael Nadal showed just how far he’s come in poker by winning a 6-player charity event at EPT Prague. But has he become good enough to beat two-time WSOP champion Vanessa Selbst in a heads-up match? Rafa played a great game, but the format and the cards were in my favor. I was able to win by using aggression in good spots and I also made a number of strong hands. I had an excellent time with Rafa and I’m looking forward to the re-match! Nadal took the loss in stride by saying, “It was a great honor to play against a strong competitor and, although I lost, I had a lot of fun.” Besides having fun, Nadal also helped generate €5,000 for CARE International, a humanitarian agency that delivers emergency relief and works on long-term development projects. As we know, Nadal won an EPT Prague charity tournament last year; he beat out football legend Ronaldo, skiing champion Alberto Tomba, field hockey legend/poker pro Fatima Moreira de Melo, Ukrainian footballer Andriy Shevchenko and 6-time WSOP champ Daniel Negreanu. The fact that Nadal won a small tournament with Negreanu involved is what impresses many people about his poker evolution. The 13-time Grand Slam winner only started playing poker in the summer of 2012, after signing a deal with PokerStars. Since that time, he’s worked on his game under the tutorship of his poker coach, Alfonso Cardalda. 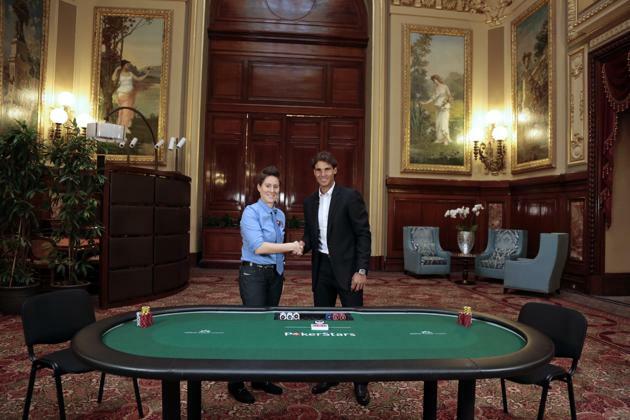 Nadal has been playing online tournaments and Zoom Poker when he gets some time away from the tennis courts. Additionally, he’s done promotional worth for Stars, like when he mingled with tennis fans/poker enthusiasts during an event at the 2013 French Open.